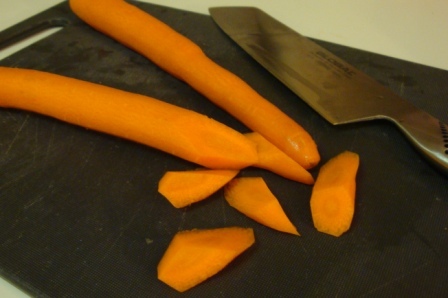 Oblique cut: cut carrots at a 45 degree bias, quarter turn it towards you so the cut side faces up, cut again at 45 degree right through the middle of the cut face. Quarter turn it again and repeat the process. Have you ever been in a situation where you don’t know what to make for dinner, so you resort to something basic and generic that you’ve made a million times before, and something that thousands of other families in the continent are also having tonight like a pasta bolognese, chicken casserole, or a stew? And so you go through the drill, you make the dish, you feed your family with it, and everyone eats it with no complaint. I have an experience to share that might change your perspective the next time you make one of these mundane dishes. One day in culinary school, I was assigned a task to cook something from Irish cuisine. “Irish cuisine? Isn’t that just meat and potatoes?” I thought, wishing I was the student with the Caribbean cuisine assignment. I chose the Irish stew, and then headed out to find Chef Duffy, an English man with an Irish father. “Chef Duffy, what’s in an Irish stew?” I asked. “Beef, potatoes, carrots, peas….you know,” he shrugged and looked as though he was sorry he couldn’t give me a more exciting answer. “There’s no Guinness or something in there?” I inquired, desperate for anything special. “Nope.” I got the point, it’s just a stew. “Then I’ll make it the best gosh darn stew I’ve ever had!” I thought, inspired by my disappointment. Here was the philosophy I adopted and the moral of the story: Maximize the flavor potential of every boring ingredient you have. First, the meat. I was given pretty much the cheapest cut of beef available, but it didn’t matter, because I was going to, that’s right, maximize its potential. Firstly, and most importantly: I salted the beef before I did anything to it. Salting the stew at the end would’ve made my liquid salty, but the beef would’ve remained bland. Salting the beef now gives the salt a chance to penetrate the meat itself. Then I tossed the beef in flour and seared it in butter and oil. Butter for flavor, oil for higher smoking point. The flour helps with browning and thickening. I used high heat for maximum caramelization, because caramelization equals flavor and color. By the way, by sear I don’t mean stir-fry. I didn’t touch the meat until I made sure it was well browned, then I flipped it and let it brown again on the other side because as soon as I stirred it around, I would’ve lost my color. Also very important was my searing the beef in small batches—crowding the pan causes steam which leads to insipid, uncaramelized beef. Next, I deglazed it with chicken stock. Not the stuff from a cube, but the one I made with love which I knew was flavorful and delicious. I could’ve used water, but as one of my chefs always says, there’s no love in water! Then I salted it again, because now I wanted to make sure my liquid was salted so that when I add my vegetables, it would season my vegetables as they cooked. If there was one difficult thing to excel in making a stew, it’s presentation. How do I make it not look like a regular stew? I turned to my veggies. I chose the oblique cut for the carrots for a geometrical variety preferable to stews with only cubic shapes, and it usually gets people wondering how they were cut that way. I processed parsnips the same way except double in size for, again, variety, and so that I could add them with the carrots since parsnips take much less time to cook. I wanted each vegetable to have a different color, so I opted for red-skinned potatoes. I cut them into ½ inch cubes because it’s a nice bite size and because that’s the size that would take the same amount of time to cook as my carrots. All the root vegetables went in for 10 minutes before offing the heat, at which point they were tender but not disintegrated into unidentifiable lumps, unless of course, you were making your 5-month-old some Irish stew. Looks tastier than boiled mushrooms, no? I added mushrooms for extra umami…and just because I love mushrooms. I chose crimini mushrooms, again for color, and I cut them into quarters like cute little playing cards spades. But boiled mushrooms? That’s not maximizing flavor! So I seared them in butter, same technique as the beef, until they were beautifully crusted. And yes, I salted them too. I noticed I needed extra thickening for my stew, whose smell was now triggering salivation, and I could’ve add a flour-water slurry to thicken it, fast and easy, but we’re maximizing flavor here, and that wouldn’t fit into our mission statement. So I made a brown roux by cooking equal weight of flour and butter until it darkens. I added just a little bit of stock and whisked until it was smooth and pourable, this helped it assimilate into my stew easily without lumps. Some peas went in at the end, and after minor adjustments for salt and pepper (apparently in Ireland they use white pepper), it was done. It was a beautiful stew, as confirmed by my Irish taster who grew up eating stew weekly in his motherland, who was also surprised by how good “just a stew” could be. Beef, tender and flavorful. Vegetables, perfectly cooked and colorful. Liquid, bold and well seasoned. No special ingredient was added–no spices or exotic herbs like when I cook Thai food, not even beer (which for some reason I thought was essential in an Irish stew), but I employed every technique I knew and made the best out of every ordinary ingredient for an extraordinary stew. Beef Stroganoff /Easter Bunny Pie /Stock vs. Broth? The oblique cut is also known as the “rolling cut”. I use it often. As a non-chef person who is indeed bored with stew and also with food preparation in general, I find this very inspiring. Thank you!